Our top ten tips and home remedies answer questions about food, fur, treats, vaccinations, spay and neuter, and upset tummies. Everyone agrees that care and proper nutrition is essential for owning a happy and healthy dog. You've arrived at this page because you want to learn what we recommend, right? So let's begin by reminding you that a Polarbear dog is unlike any other dog you have ever owned. Toss out any ideas you have about proper care and feeding of dogs before proceeding through this page! This is a short ten (10) minute read and well worth your time! In order to have one of the best dogs you will ever own become the perfect housemate, it's important to follow the advise you are about to read. This information is not just for our clients, it is for any smart dog owner! One of the assignments we give our dogs as "Angels on Assignment" before they leave our home, is to make their owners happy! This is only achieved with help from their human! A "human with fur" communicating with his owner! This page begins with a section on communication, because unlike other dogs, a Polarbear is pretty much a "human with fur". Like any successful relationship, communication is key, agreed? Your dog loves hearing your voice! Remember when we said that bonding begins during the video conference? It's true. When the excitement wears off and your puppy is settled in, you may find talking to your dog difficult at first because you're not use to owning a smart dog. We suggest that before your new puppy gets home, you create a word list for training your puppy. Locate the word list on the refrigerator, wall, or other central location so that everyone in the family can reinforce the words with the puppy. Words like.... car, bed, ride, walk, poop, up, down, etc.... just be consistent. Words, eye contact, a cheerful tone and praise work wonders in training your new friend. It's also helpful to carry a handful of dehydrated meat pieces in your pocket during the first six months while your puppy follows you around. Wait until you have your puppy's attention then use the Command-Treat-Reward method to train your puppy. You will also learn some of these methods when you begin your puppy class. Early socialization and puppy training is critical to owning a well mannered and friendly dog. Shepherds are prone to shyness towards strange humans and other dogs unless they have been properly socialized. Follow our advise, and you will have a great experience around strangers and travel where ever you go. Start calling around to find a good puppy class. The puppy class MUST be a public class with strange people and other dogs. No private sessions allowed until the introduction classes are completed (usually 1x a week for 6 weeks) We recommend Petsmart or Petco Puppy Classes. If you would like further training with a private trainer, that is great, as long as your puppy has completed their initial PUBLIC puppy classs. We recommend making a visit to a pet store with your puppy in advance and getting your puppy comfortable with the idea. Once the training class begins, clickers or other training devises are props for training that are really not necessary for training our extraordinary dogs. A Polarbear needs no more motivation than your approval! They are human motivated, remember? If you doubt the benefits of public classes, here are just a few; Puppy classes makes great "date nights" for couples. Families with children can join in too. When parents include children in training of their dog, it's good parenting! Your child is learning many character building skills, not the least of which is developing a sense of ownership and accomplishment. Walking through a local Petsmart is an easy and no cost activity that will do wonders to socialize your dog. Socialization is a great way to make friends for both human and canine! In a world that is continually removing us from social "connection", why not try it? Last but not least is the sense of pride you will feel when your puppy stops "traffic" and is voted "top dog" of their puppy class! Don't forget to let us know how your puppy did in their class. Did you ever think that a name could keep your puppy safe? When naming your puppy, think of a two (2) syllable, strong vowel sounding name! If your puppy is a distance away, calling your puppy by a strong name makes it easier for them to recognize it! There are plenty of websites dedicated to helping you find just the right name for your dog. Just be sure that the name is one that the whole family can agree upon. When it comes time to register your dog with the American Kennel Club (AKC) just remember to add "Polarbear" or "Polarbear's" in the name to identify your dog. Several years ago, we had a client named Donald who was in a terrible auto accident in Colorado. He was rushed to the emergency room and his dog, Casper, went to the shelter. The shelter workers scanned and found Casper's microchip and immediately called us. Before this man passed away, we were able to speak with him in the hospital and give him our assurance that Casper was okay and we could take care of him. Donald passed peacefully knowing we were here for him! We eventually re-homed Casper to one of our clients and he is much loved and doing well as a "search and rescue" dog in Douglas County, Colorado! When it comes to food and nutrition, our advise is "KISS" or "KIS" to our highly intelligent clients! Notice we left off the last "S" on purpose. You have not arrived at this page because you qualify as the last "s" in this acronym. You know what I mean! Read the label of the dog food on the shelve before buying. Make sure that meat is the first ingredient and it is has a minimum of 26% protein of the overall content of the package or can. Most store brand dog foods use fillers consisting of grains and then advertise the heck out of their brand in order to maintain market share. The reason your neighbor has large poop piles in their yard, is because they are feeding bulky, undigestible, food to their dog. Minerals and other vitamins and nutrients are also essential. See the following link to compare dog food brands, but don't leave just yet, even more important information follows! Puppies don't necessarily need large breed puppy formula as long as you're following our guidelines. Automatic feeders and waterers are ideal and keep an area neat and clean. Make sure that your puppy or dog can easily access their food and water. Our purebreds are big dogs. Puppies will go through incredible growth spurts to attain full size by two (2) years of age. The only time it is necessary to limit food is during the housebreaking stage right before bedtime. Never ration food, ever, unless ordered by your veterinarian. We believe dogs can acquire eating disorders, just like humans. If they anticipate that their food will be taken away, they will binge because they think they will otherwise starve! Our recommendation for a family with multiple dogs is to make sure your growing puppy can have their own food. Feed in different locations if necessary, including using a baby gate that a larger dog can't get around. Coprophagia - poop is not food! Simply put, coprophagia is the scientific term for dogs that eat poop. Yuk! Right? There are several common causes of this behavior. Sometimes when a puppy is finished pooping, they want to "hide the evidence". This is because someone has punished them for doing their duty! We warned you in the previous section that we would tell you why we never reprimand our puppies! One of the reasons you love our dogs is because of their incredibly sensitive and loving temperaments. They are natural born "people pleasers". A puppy could be be cleaning up his or her living area because they want to make you happy! Sometimes a puppy or young dog learns to eat poop by watching their mothers clean up after them. Following birth, a female dog will eat her newborn puppy's feces in order to conceal their puppies from predators. It is a survival mechanism. The only way to resolve this issue is to immediately clean up after a puppy or dog "does their business". Like anything, there are products you can buy, but we think it is a waste of money. Speak positively to your puppy or dog, maintain a healthy environment to rule out stress. Keep your yard picked up and hire a "poop scooper" if necessary. There are many creative products in the market that you can find to help you maintain your yard and keep this problem at bay. Some dogs can be finicky eaters, including growing puppies. Sometimes they will be ravenously hungry and other times they will not eat. If you fuss over your puppy, they can become fussy eaters. Never make food the issue. Don't be concerned about the growth of your puppy. If you follow our guidelines, you will have a happy, healthy dog, that reaches their full size by two years of age! There is a trick, however, to get them to eat. Offer them cooked poultry skin or canned dog food. Just keep in mind what we said earlier... this is the smartest dog you will ever own. Careful, because once you switch to the tastier food, your puppy may go on a hunger strike in order to convince you to return to their preferred meal. While we want you to treat our "humans with fur" like family members, there is a limit. 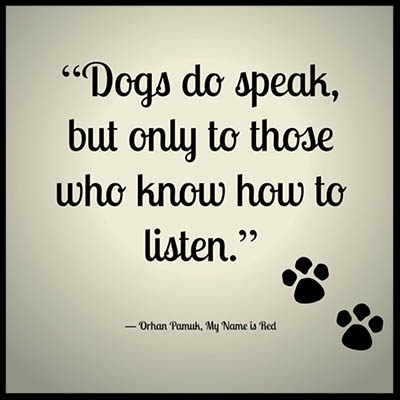 We want all of our dogs to have good manners and be representatives of a true Polarbear and the perfect dogs that they are. Begging dogs are dogs with poor manners! 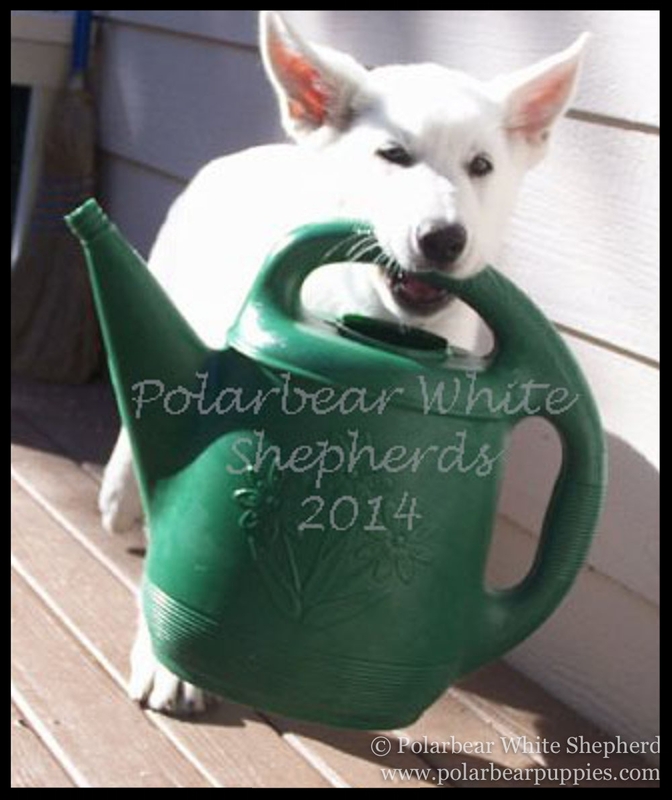 White shepherds, like most shepherds, need additional enzymes in their diet. This is partly because processed dog foods lack natural enzymes they would ordinarily get in the wild. The best treats are those that not only taste good but are nutritious. If you have ever observed a dog digging in the dirt and eating it or chewing on grass, it is not just because they are bored or wanting to be a nuisance. Dogs eat dirt and grass because they are craving essential enzymes they need for their digestion. The easiest supplement to give a dog is eggs. Simply break a raw egg and add it to your dog's dry kibble. Cooking the egg is not necessary. Organ meats are great supplements to your dog's diet too as long as they are fed on an occasional basis. The next time you cook a chicken or turkey, save the organ meats and make your puppy a delicious stew using organ meat, fat, and juice. We also recommend beef or pork liver. Your dog will devour it! Again, organ meats have essential enzymes your dog requires for digestion. Whenever you cook meat, just remember to skim off the fat and save it for your dog. Pour it on their dry dog food. Skimming off the fat and saving it for our dogs keeps us healthy too! All dogs love treats. Our dogs' favorite? Beef knucklebones. Bone marrow is some of the best nutrition there is and bones will not hurt your puppy. Next time you plant bulbs in your garden, notice the ingredients on the bulb supplement package... it is bone marrow! Another possible reason if you find your dog or puppy rooting in the soil. In addition, bones relieve puppies of boredom and are like "dental floss" to a dog. Ask your butcher or the meat department of your favorite grocery store or market to prepare some large knucklebones for you. Microwave the bones for a few minutes when you get home to make them juicy and bacteria free! Keep some on the knucklebones on hand by freezing them. You never know when a good treat will come in handy if you must leave your dog alone for any length of time. Bones are also great boredom relief. Dogs, big and small, love the gristle and it will be a treat they can chew on all day. Other treats we like are dehydrated pig ears, beef hide, and fish or poultry skin. If your puppy or dog starts to get loose stools, limit the "fat", and put the treats away for a time. Bottom line when it comes to treats and supplements, there is no need to buy the expensive brands at the pet store. Natural treats are better. Trust us. Remember our motto... K. I. S...... Keep It Simple. Get use to the fact that you have a smart, talking dog. They will whine when they have to go pee or poop. Something else to watch for is when your puppy starts to "squat". Make sure everyone in the household understands what to do. Quickly pick up your puppy and take them outside where you want them to go. Don't punish them, ever! We will tell you why later. Crate training is easy. Start as soon as your puppy arrives home. Prepare their puppy crate by locating it in a bedroom where they will sleep at night with their closest family member. Cover the crate with a blanket and put a comfy cushion inside with a few toys and a sock or two that smells like you. Puppies hoard shoes and socks because it is the only way they know how to have you close to them. It is all about your scent. Crating is by no means mean or cruel. Dogs find sanctuary in the quiet, dark, confines of the crate and it allows them to settle down, relax and sleep. Dogs "den" by nature, which makes crate training the ideal means to housebreak your pooch! Crating should only be used at night. If the puppy must be left in the home alone, put them in a "puppy safe" room with another pet for company. A few hours before bedtime, remove any food dishes from the floor. Then when the family is ready for bed, take your puppy out to go potty and reward them! Before you crawl into bed, put your puppy in the crate. They may whine and cry for short periods, but they should settle down and sleep through most of the night. The first few nights may be rough, but hang in there. In the morning, immediately lead your puppy out the door to go potty. Take them to the same spot or location each time. Replace dog dishes and repeat every night. Our puppies quickly housebreak and will go to the door to go outside. Dogs have nervous systems much like humans. When eating and drinking habits change, something is wrong. Usually a dog that is experiencing diarrhea or an upset stomach has acquired an illness, parasites, or anxiety due their sensitive spirits. Our dogs pick up any negativity in the home, which is why we work so hard to find the very best homes! If diarrhea or vomiting becomes the issue, by all means, rule out illness. Once diarrhea sets in, dehydration is something serious and can lead to further problems. Puppies and dogs are prone to parasites. Although puppies leave home parasite-free, nothing is to say that they won't acquire them en route to their new home or later at the veterinarians office. The immune systems of puppies are not fully developed for many months and nasty bugs can be picked up anywhere people and pets congregate. The delivery system is usually your dog's paw pads. Dogs can pass parasites on to humans and humans them around each from door knobs and elsewhere! If you don't believe us, catch an episode of Monsters inside Me Animal Planet! Regular de-worming, tick and flea treatment, and maintaining a clean household and yard, is a must. a FRESH stool sample to your veterinarian and ask them to test for any and all parasites that are common where you live. It's also a good idea to take your dog's temperature using a regular thermometer, normal range is 101-102.5. When you delivery the stool sample to your vet, it's very important that your vet tests the sample while it is still fresh. If the test results come back positive for parasites, your veterinarian will provide a medication to resolve the issue. If your veterinarian rules out illness, nerves is the likely culprit. In either case, when you discover that your puppy or dog is suffering from diarrhea or tummy upset, it is perfectly okay to give them the medication Loperamide, which is the same over the counter medication humans use! Look for either Imodium or Kaopectate brand and administer using a plastic syringe or baby medicine dropper. Puppies or dogs will quickly improve, become perkier, and stools will become firmer. The dosage is two ( 2) cc/ml per pound body weight, twice a day until the diarrhea resolves. Poop should always be picked up and properly disposed. Teaching your puppy the proper place to go using the "crate training" method. It is important to learn the proper way to housebreak your puppy or dog. Please don't reprimand your puppy for doing their duty! Just follow our guidelines. Someday, when your dog is a perfect housemate, you can put the crate in the garage and let your friend roam free, but until that time, save yourself the headaches and enjoy! Polarbear's Prince Caspien, handsome as ever at 10 years of age. One of the first signs of a well-bred purebred shepherd dog is the quality of the dog's coat. Coat quality is one of the many issues we considered when refining our brand of shepherd. Our dogs have short, arctic white fur, that is smooth as satin to the touch and easy to maintain. Our dog Casper, in the above photo, has an exceptionally high quality, short, coat. We prefer shorter coats because as members of the family, they primarily reside indoors. A high quality coat will be relatively shed-free and consistent throughout the year. Shorter coated dogs produce an undercoat in winter months which allows them to manage just fine for shorter periods of time. A low quality coat, on the other hand, will have a mangy and dull appearance. These dogs have fur that comes out in chunks. If you have ever had to clean up after a shedding dog, you know what a nuisance it can be! Believe it or not, shedding has nothing to do with diet and everything to do with genetics. Whatever the quality of coat or coat length, salmon oil is a product that you can buy that helps to reduce shedding and promote a shiny coat. Shack Von Hammer, our foundation male, taking a swim at twelve (12) years of age. Our dogs typically love water and will be natural swimmers. We want the first experience with water to be a positive one! This is why bath time is so important. Use warm water, plenty of praise, and go easy with the spray hoses during the bath. When finished, dry them off with a giant towel and cuddle! Then when introducing your puppy to a lake, river, stream, or ocean, allow them time to explore on their own. Never force a puppy into the water. When you permit your puppy to learn on their own that water is fun, your puppy will be swimming in no time. Some of our dogs take longer than others to acquire this skill, but visually all of them do! A Polarbear's natural love of water, their athletic bodies, intelligence, strength, and heart make them ideal Dock Diving Dogs. It is a brand new sport! Would you consider joining? Smart dogs need on-going intellectual stimulation and activities in order to keep them happy. This is especially the case when a puppy enters the "teenage stage" which occurs from about four to ten months of age. If the puppy lacks intellectual stimulation or activities, this is the time they may get into trouble! At the very least, take your puppy to "Puppy Daycare" for several days a week. If you want to do something fun for the whole family, consider joining the local American Kennel Club "AKC" and enter your dog in a sport. AKC has local clubs in nearly every county in North America. In general, our dogs have a superior body build, intelligence, and passion to please, than most other dogs, which makes them ideal athletes. Remember, these are "humans with fur". We have assigned you the job of letting them serve you with something to do. Why not let them join a sport? They love to please and make you proud! 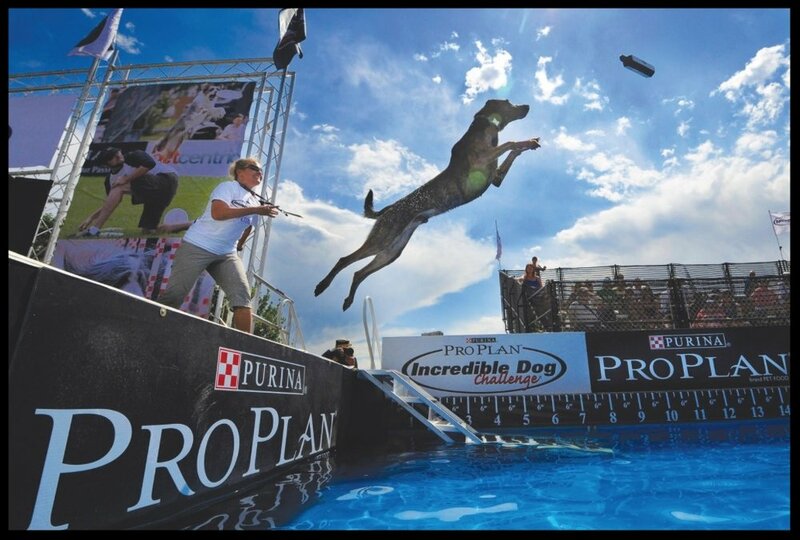 If you have a puppy with a higher energy level, try a sport like Agility or Dock Diving. A great family activity for the children is 4-H or Future Farmers of America "FFA". These clubs are "character building" programs that teach children responsibility, caring for their animal, how to manage money, and fun with their dog while doing it. We highly recommend choosing a club with a good leader, usually another parent, that you like. Most counties in the U.S. have "extension agencies" in their county court house, whose purpose is to provide information to the public for families in rural areas. Children as young as eight (8) years of age can join and enter their puppy as a "project". If athletics, aren't their thing, try 4-H or FFA! It's a great means of teaching a child about money and responsibility. One of our family members helped her parents pay for her college education with money she earned from her 4-H summer projects. The normal lifespan of our dogs is twelve (12) to fourteen (14) years of age. We have worked tirelessly for nearly twenty (20) years to avoid diseases that may appear in our lines that would shorten their life. The rest is up to you. Maintaining your dog's physical health is fine as long as you also recognize their emotional needs. Our dogs are empaths. They will happily give up their life for you. Any kind of negative environment that is on-going will affect the health and longevity of your dog. We ask all our of our clients to do their part by committing to maintaining the health and welfare of their dog. In order for our health guarantees to take affect, all of our new Polarbear owners are required to take their puppy to a "well puppy check" within 24-48 hours of delivery. Each puppy comes with a health record and microchip. Remember to bring your puppy's health record and microchip information with you when you go to your puppy's first veterinary appointment. . Have your veterinarian review your puppy's health record and scan the puppy between his or her shoulder blades to locate their microchip. We provide you with additional microchip labels inside your folder, give one to your veterinarian for their records. If you haven't yet registered your puppy's microchip, now is the time. By all means, follow your veterinarians advise if residing in "high risk" areas for heart-worm, ticks, fleas, and any other pests or parasites and diseases. Before leaving your veterinarian's office, make sure you know what medications your puppy needs and the schedule in order to maintain your puppy's good health. The only additional vaccine your puppy will require is a rabies vaccine after twelve (12) weeks of age. Do I need to shop for a new veterinarian? Pay attention next time you take your dog to the vet. Make sure that your vet knows that you have a well-bred purebred dog and you respect the breeder. Show them your paperwork. Some veterinarians will completely disregard your puppy's health record by giving them additional vaccinations as a matter of routine to "pad their bill". Over-vaccination can be harmful. Other veterinarians that perform spay and neuter on puppies younger than six (6) months of age as a matter of routine. We will tell you more about this in the next section. There are an alarming number of veterinarians who are biased against white shepherds. If, for any reason, you have a veterinarian that falls into one of these categories, by all means, shop around and find a new one. A white coated purebred dog is a coat color, it is as simple as that. In fact, white shepherds are healthier and live longer than their colored canine cousins! The best age to spay a female is closest to the puppy’s first year birthday. This is usually just prior to the onset of the first heat for females which occurs on average with Polarbear White Shepherds at 11 to 13 months of age. If the surgery is done at this time, it can greatly reduce the risk of health problems later in the dogs' life. Having the surgery done earlier than twelve months is not necessary or recommended according to the experts with whom we consult. It is even more important to wait to neuter in males. Without exception, we advise to delay this surgical procedure until the time we specify. The Polarbear Express via Alaska Airlines! Our dogs are wonderful travelers. This is a result of their incredible intelligence and calm and stable temperaments. 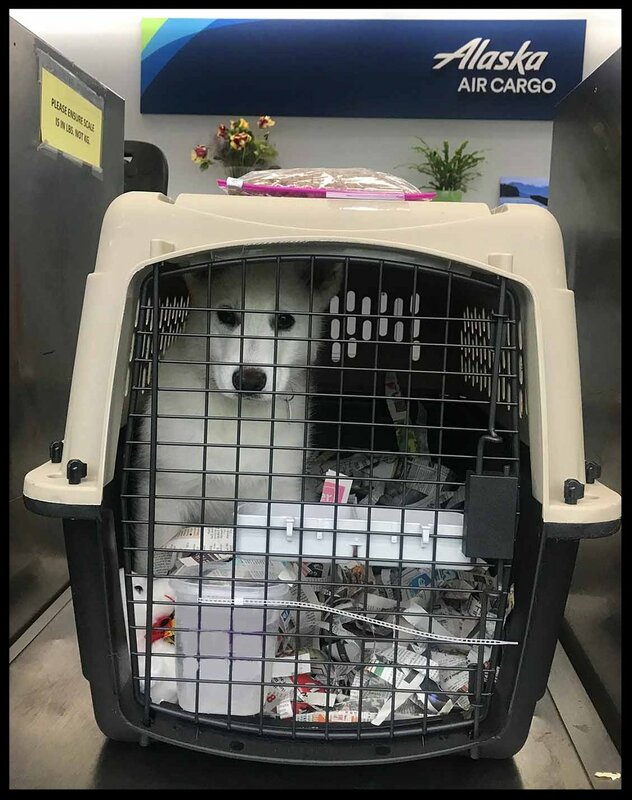 Many people worry when they turn over their dog to the cargo office. Our preferred airlines is Alaska Airlines. They treat our fur babies like family! The worse airlines, in our experience, is United. Recent events in the news has proven us right! In 2013, before the company made headline news, we fearlessly confronted the United cargo manager and company head in a private meeting . Needless to say, we were appalled by the company's dishonesty and callousness about our furry family members. Our commitment to you is through the life of your dog. After all, you have one of our kids! When you join our Polarbear Family, you are joining with other people who share many of your values, including love for these special dogs. If you would like to know what "the family" is doing with their dogs, become involved by sharing your own story. In the meantime, thank you so much for reading this page and proving to us that you truly want the best for your puppy.